If Verizon removed all Unlimited Data plans immediately, what would you do? Just curious. I plan to keep my unlimited data as long as possible. If they removed it, I may go with another carrier, though Verizon has the best coverage. More likely, I would probably go back to using prepaid exclusively and ditch my smartphone. There are too many places where I don't always have access to wifi--city bus, work, that it would dramatically change the way I use my phone if I lost unlimited. Just depends. I am going to be joining Verizon soon I believe. We would have more coverage and the gf would have less on her plate bill wise with Verizon... So I will just have to pin music and videos before going out. I believe it won't be to bad... Just have to be more mindful about caching and things instead of just streaming everything. I used to think losing unlimited data was unacceptable but I let it go and got an S5. I was offered a Loyalty Plan for $60 a month that includes unlimited minutes and text + 2GB of data. Each additional GB is $10 so its not a bad deal for someone who isn't a data abuser. This isn't for everyone but ever since I switched I've only used 200 MB a month at most and I'm saving significant money each month. I purchased a nexus 5 and used it for 7 months on straight talk t mobile. I have Wi-Fi at home, my music was cached with slacker to listen at the gym. Came close to 2.5G limit only once, I would consider dropping Verizon if they removed my promotional discount as well. 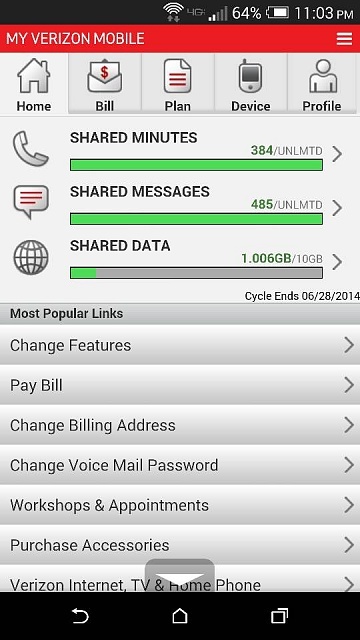 Leaving unlimited data behind and paying more each month? Seeing how much data you use and where? Good luck bro with being handcuffed or looking over your shoulder evey month thinking about how to use your data wisely and also probably paying more out of pocket. I don't believe you will move especially your one of the few who has good to great coverage in your area. I mean don't get me wrong? If your coverage was bad and you were stuck in a area that still has edge or no coverage? I don't blame you. But as far as I have read? You have been like a T-Mobile spokesman here in the forums. But as I wished you... good luck! Obviously, saving money can be a good reason to switch. However, right now I am on a grandfathered plan with 550 shared minutes, using Google Voice for texting, and unlimited data on all 3 lines. With my discount, it comes to about $152 per month ($163 if you add the insurance on two of the lines). It's hard to beat that with any of the current plans. There are probably others in the same boat---removing unlimited data would offer no financial benefit and they would pay more for less. It all depends on your families usage habits. Not all cases are the same. I just have to cache more content and my data usage will drop a ton. I just don't now due to unlimited. Also price wise it's surpringly the same if not cheaper (like a dollar or two lol). Once my discount expires (in the next month or two) my T-Mobile bill will be about 81 a month. Verizon will be about 75-80 once split with the girlfriend (thanks to her work she gets 20% off the data plan) So it won't be bad... And when we do travel the coverage won't be an issue. It's more for her. After her discount expires she will be paying 115 ish.. But on Verizon it will be the same as me (75-80) and she'll have the coverage. Her average data usage is 1.5 GB a month. Also yes I still love T-Mobile... I really do... But if having the coverage so she can Facebook and lower her bill means I need to cache more and be more conscious about data.. I'll do it. For the limited data options and especially for multiple lines, Verizon is competitive, and in some instances cheaper. Now, you do get unlimited 2g on the limited data lines, so that is something to consider, but if you just want to use high speed data but not too much then Verizon can be an option even for those who want a low price. Also data is shared, which can be good or bad, depending on your needs. Once I swap I'll keep everyone up to date how I'm dealing . Voted: Keep Verizon and buy more gigabytes. Reason being they provide THE best coverage (voice and data) for my needs, so another carrier just isn't an option. I'd bump up the data plan to 6GB/month which would pretty much cover my usage patterns even during the NFL season when I stream games. Also using Wi-Fi just isn't very practical for me as we're stuck with crappy DSL at home, so I'd rather be on Verizon's much faster LTE. Any other Wi-Fi (ex. work or public) isn't an option either as I don't trust them. Not to mention I really dislike having to worry about switching back and forth between Wi-Fi and cell data. Considering I've been offered a 6 to 8 gig plan to get me off unlimited, even though I only use about 4-5 a month, mainly cause I'm not going all out, I'd have to say offer me a 10 gig plan then, for like 40 bucks. But God I hope they keep UDP, cause at some point I'm getting a tablet, and since I have 10 bucks off a month for the next 2 years, I will be trying every so often the hotspot feature. I would switch to Straight Talk. Verizon is good here, but not worth what they charge over Straight Talk's $45 a month plan (unless I have truly unlimited data and hotspot). And AT&T has much better coverage for my trips thru West Virginia on I-77...where Verizon has pretty sparse coverage for a significant stretch. I'm in the "it depends on what they offer" camp. If they keep my bill at $120 and offer 20gb combined for my wife and I, I'd stay. We use about 10-15 gb a month right now (mostly me) and we can't get a 4g signal at home and I barely get one at work. If they upgraded the network, I would probably use a bit more data. And my wife would get a 4g phone, so her use would go up as well. We couldn't do that 6gb each plan they offer, that's just not enough for me (she'd be fine). I'd probably just switch to T-Mobile unlimited. The price would be $20 more a month, but I wouldn't have to worry about watching my usage. dpham00, in all fairness what would in a reasonable response make you give up your unlimited data everything plan? Even though what your paying now is not the cheapest plan out there total? In other words what is having a unlimited data plan worth to you? It's working out not to bad so far. - Cached all my Google music so haven't Streamed when listening at work. - wifi at work... It wasn't good enough for streaming but it's fine for Forums, websites, etc. Just not streaming but I've solved that by simply downloading the night before. I figure I pay Comcast for cable Internet.. Mine as well use it . It depends on your needs. I want a phone that works at the most places possible. For me this would be Verizon. For emergencies, my Verizon phone can roam on Sprint, att or tmobile too in case another carrier gets signal and Verizon doesn't. Same can't be said for androids on tmobile and att. For me, emergency usage is the most critical. You might never use it but if you need it, it can save your life. I hope you aren't in a Comcast 300GB market, it's the sole reason I didn't sell my UL plan. Can't believe I am allowed to use more data on my cell phone than my home Internet connection. I'm in a 250 GB market.. The cap has been suspended for as long as I can remember (I'm talking 10 years or more). I had it (comcast) when I was 16 at the parents... Cap suspended. I'm 26 with my own house now.. Cap still suspended. Same here. Cap suspended with download speeds at 105 (average I receive is 125 Mbps) and uploads of 25 Mbps. My speeds as usual with Comcast are above the promised numbers. Good to hear how many days have you been with Verizon? How's the M8? I am thinking about getting either the m8 prime(if it comes out) or the Xperia z3 later this year. Sadly if this one is messed up we will have to leave and either go back to T-Mobile or go to AT&T. We haven't used much data. Most of it has been me doing speed tests lol... Otherwise it would be nothing pretty much. By BillEwhizz in forum New to the Forums? Introduce Yourself Here! LG G2 Car Charger - What Can I Count On?